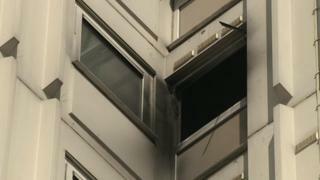 A woman is in hospital with life-threatening injuries following a fire in an Essex tower block. The 30-year-old was one of seven people, including a baby, taken to hospital after the blaze on the ninth floor of the Balmoral Road flats in Westcliff. A number of other people were treated at the scene for injuries including the effects of smoke inhalation. The fire was reported shortly after 23:00 BST on Saturday. Ch Insp Simon Anslow, of Essex Police, said: "The cause of the fire is under investigation and detectives are looking at the circumstances leading up to the incident. "I ask anyone who was in that area around that time and saw any suspicious activity to get in contact." The majority of residents made their way to safety when the building was evacuated, but firefighters rescued two adults and a baby from a ninth-floor flat. He said: "A woman was shouting 'help me' in panic and there was a bad smell of burning. "The fire alarm was going off and there was a lot of smoke so we ran down the stairs." Some residents spent part of the night in a nearby hall, where hot drinks were provided.